Brief：According to China's Vice-President Dr Li Yuanchao, Coega IDZ is one of the best developments in Arica. right, helps him cut a cake. China’s Vice-President, Dr Li Yuanchao, completed a whirlwind tour of two Nelson Mandela Bay manufacturing facilities yesterday, ahead of Bi-National Commission talks with the government in Cape Town today. The visit to what Li called “the Golden Coast” signals growing Chinese interest and potential for increased investment and tourism in the metro and the Eastern Cape. The relatively low-key visit took many by surprise, including the Nelson Mandela Bay Municipality, which had not been aware of it. Although the Nelson Mandela Bay Business Chamber knew about the visit, it took no part in the proceedings. China’s second-in-command – along with a Chinese government delegation – toured the greater Storms River area and TAG Yachts in St Francis Bay, as well as Chinese truck builder FAW and the adjacent Coega Industrial Development Zone (IDZ) in Port Elizabeth, where an R11-billion Chinese vehicle assembly plant is under construction. Li lauded the Coega Development Corporation’s IDZ as the best industrial development zone he had seen in Africa. “I have been to many developing countries and many African countries, and I think the [Coega] IDZ is one of the best,” he said. Li said he would take his experience of the IDZ back home and wished it even greater success. “I hope the cooperation between our countries can be more sustainable,” he said. The vice-president, who arrived in Port Elizabeth on Saturday, spent two nights at the Radisson Blu hotel. He left for Cape Town at 1pm yesterday. Municipal spokesman Mthubanzi Mniki confirmed last night that it had been a “quiet visit”, but did not want to comment further. The metro’s political head of economic development, tourism and agriculture, councillor Andrew Whitfield, said earlier he had not been aware of the visit. “Nothing has come to my office,” he said. 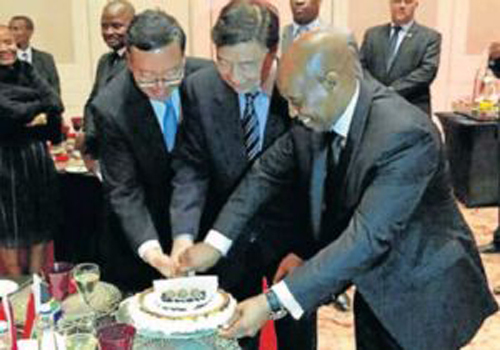 Buoyant Eastern Cape government officials had high expectations of future Chinese investment into the region. A well-placed government insider said Li had referred to the province as the “Golden Coast” due to the ample potential he saw here. Rural Development and Agrarian Reform MEC Mlibo Qoboshiyane hailed the visit as a great success, saying it boded well for increased Chinese investment in the province – and particularly the Bay – going forward. He said Li, who was accompanied by a delegation of about 21 people, including tourism and economic representatives, had been impressed with what he saw in the region. “We are excited about the visit and are confident of further Chinese direct foreign investment into this region,” Qoboshiyane said. “Among the sectors being considered for potential future investment are aquaculture, agriculture, tourism and manufacturing, particularly the automotive sector. Knowledge and technology transfers had also been discussed. The Chinese had also expressed interest in the development of major infrastructure such as dams and agricultural projects in the province. Economic Development, Environmental Affairs and Tourism MEC Sakhumzi Somyo described the visit as a fantastic experience, saying Li had been excited to be in the region. Somyo pointed to the regional tourism sector as a potentially significant beneficiary of growing ties between the two countries. “The vice-president liked what he saw and was impressed with the potential the area has,” he said. St Francis Bay yacht builder Tim van der Steene said he was honoured to have been given the opportunity to deliver a presentation on his business, TAG Yachts, and the industry to Li on Sunday. “It was a great honour to meet him, particularly as one of the most influential leaders in the world today,” Van der Steene said. “I viewed the visit in terms of potential knowledge and technology exchanges with China and in terms of Operation Phakisa or the oceans economy drive by the national government. “We certainly have massive potential in the Eastern Cape in terms of the development of an oceans economy,” he said. Deputy President Cyril Ramaphosa will host Li at Tuynhuis today for the sixth session of the South Africa-China Bi-National Commission (BNC), which is aimed at consolidating bilateral political, economic and trade relations between the two countries. It will review progress made since the last BNC held in 2013 in Beijing and receive reports from the sectoral committees on foreign affairs, trade and investment, energy, mineral resources, science and technology, and education.